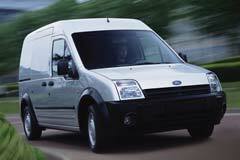 In 2010 the Ford Motor Company unveiled its newest edition to the minivan line up. The Ford Transit Connect is a unique alternative to traditional minivans. The scaled down size and European inspired design make the Transit Connect a viable option for those in the market to buy. Virtually unchanged since 2010, the Transit Connect comes equipped with a four cylinder engine and 135 cubic feet of cargo space. In addition, customers have a choice of two different styles: the Van or the Wagon. The Van is more suitable for hauling cargo, while the wagon is better for transporting passengers. Although the compact vehicle does not pack a powerful punch, it does have an affordable price tag and ample space. The initial model also only came in one base trim, with an interior that lacks luxury frills. Customers looking to buy a used Ford Transit Connect will find that early models came equipped with stability control standard on the Van, but optional on the Wagon. With a few years under its belt, a used Transit Connect may prove an option for buyers, especially business owners.